At the moment we have so many amazing hunts out on the grid, that you really have to manage your tie properly to do all of them :p.
Socialite WrenNoir Cerise has been murdered and burglarized! They took all of her Finesmith jewelry AND stabbed her FIVE times! They must have really wanted her dead! 14 designer have placed gifts that are each 10L$and as much as I understood it the 10L$ of every item will support the ASPCA. Today I would like to spotlight the hunt item of Lybra. Lybra Rage made an amazing full outfit including the cool makeup for the Murder Mystery hunt. 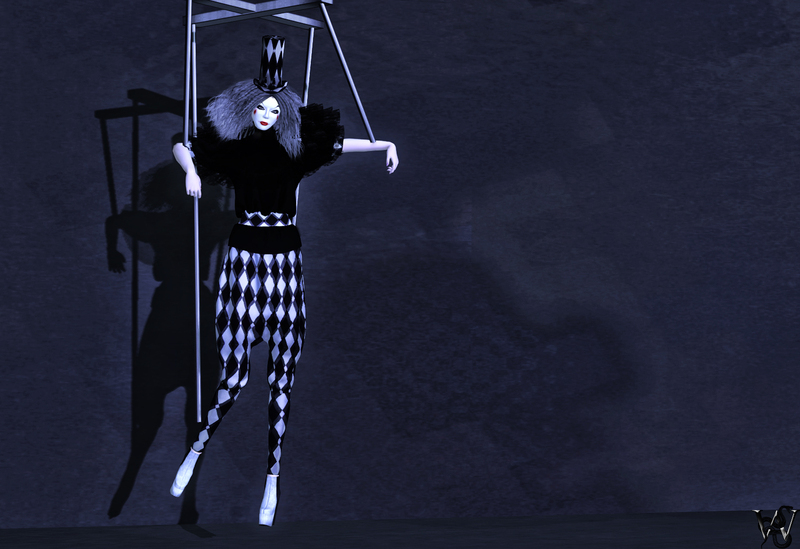 The outfit is called “Clown Couture” and it did remind me on some of the puppets I know from my childhood. So i could not resist to go with the puppet idea ;).